The AB109 program uses an Assertive Community Treatment (ACT) model for individuals with serious mental illness that are being released from prison under AB109. It is funded by the Los Angeles County Department of Mental Health. 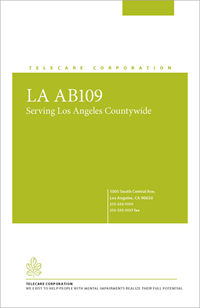 AB109 exists to help people live successfully in the community and make strides toward their hopes and dreams and achieve their personal recovery goals, while avoiding unnecessary psychiatric hospitalization. The program provides individuals the opportunity to create a second story of their life. Telecare has created a recovery-centered experience for people served. Telecare's approach is based on a belief that recovery can happen. Programs and staff strive to create an environment where a person can choose to recover. By connecting to each individual's core self and trusting it to guide the way, it is possible to awaken the desire to embark on the recovery journey. Referrals are coordinated by the Los Angeles County Department of Mental Health. Due to HIPAA (Health Insurance Portability and Accountability Act) requirements, AB109 will not release member information unless we have a signed authorization from the member. AB109 is an outpatient program and, as such, our members live in the community.